Today I'm trying Boulevard Brewing's Snow & Tell, an oak-aged Scotch Ale and the brewery's newest winter seasonal. 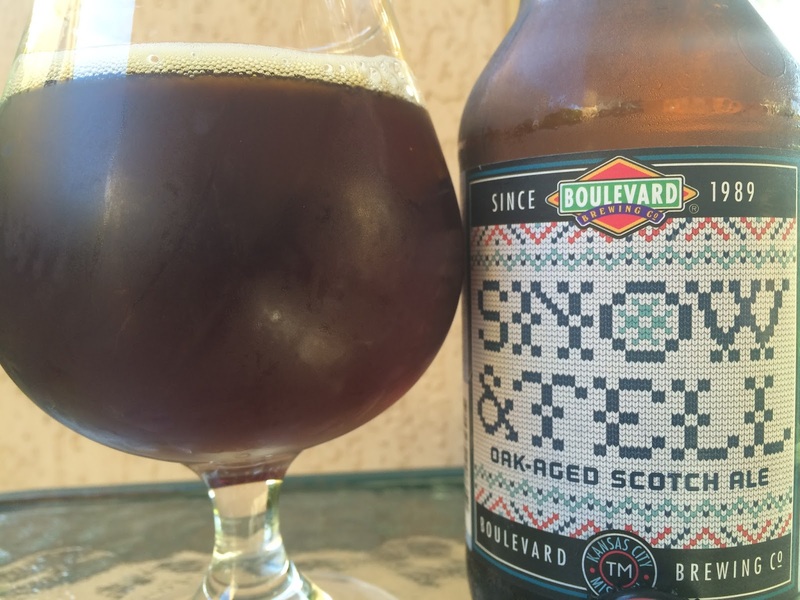 The label depicts the beer name knitted into a pattern that you may perhaps find on a scarf in Scotland. Best By 03/14/16. 6.3% alcohol. 25 IBU. Caramel sweet aroma with a little spice, not strong but nice. Caramel flavors show first but are way more subtle and not nearly as sweet as I was expecting. That more reserved and balanced approach was actually a pleasant surprise. Hints of prunes and raisins meet a touch of citrus fruitiness. Maybe there's a hint of smoke too. I didn't find any oak aspects, but whatever. Herbal and spicy at the finish and both linger until you take your next sip!